Site Sponsors Steidinger Brothers, Inc. Plumbing – Heating – Electrical Services, Appliances, Products, and Installations Steidinger Brothers, as in Loren and Greg, purchased Nussbaum Plumbing & Heating in 2012 and they, with their experienced team of technicians, have built a reputation for creating and maintaining an integrity to their clients that is evidenced by their quality in workmanship and dependability. They offer a wide range of appliances and products, that include well known and trusted name brands, that they will install and service with the know-how that comes from experience and dedication gained from diligent updated research, training, and accumulated job histories. They have an ever growing customer base that is typically comfortable and confident in the cost effective work and products that Steidinger Brothers provides in a timely way. 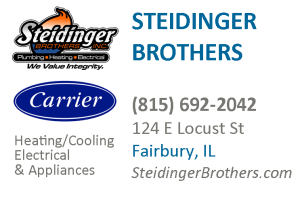 Steidinger Brothers, Inc.
Geothermal Heating & Cooling – efficient, environmentally friendly, & substantial cost savings – Steidinger Bros. is a member of the Geothermal Alliance of Illinois and they will provide you with a free evaluation and estimate for your home or business. Visit their web site for a comprehensive presentation on all the details for their products and services at SteidingerBrothers.com. Check them out, they do it all and they do it well.